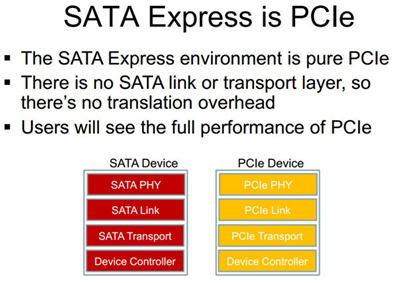 The SATA-IO group recently confirmed revision 3.2 SATA includes ensuring support SATA express. The standard SATA goes into high gear with the version 3.2, which has been approved by the SATA-IO association, the umbrella organization of the SATA standard. The SATA standard associated with the internal storage in PC, such as SSD, hard drives and optical drives, The SATA Express (originally announced in January 2013) comes up with a new specification that enables the coexistence of SATA and PCIe. This is a major innovation as it increasing the bandwidth of the internal bus of PC covers the way for integration of storage devices swifter and therefore more efficient PC. 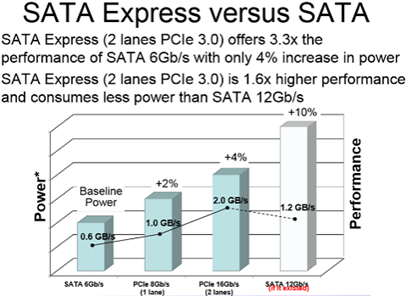 While the speed of the SATA 3 capped at 6 GB/s, PCIe Gen 3 on two ports (PCIe x2) up to 2 GB/s or 16 GB/s. To operate at these speeds, the host controller and storage device must support this new version of SATA. It seems SATA technology continues to evolve to reflect the changing requirements of the storage industry, updates contained in the specification of 3.2 as support SATA Express and improvements for emerging SSHD are driven by current market trends. These new features demonstrate the continued commitment of SATA-IO to provide storage solutions at low cost and high performance. With the revision 3.2, the SATA standard goes indeed to date with the introduction of new features. Specification of revision 3.2 SATA is now available (free to members of the SATA-IO group and a fee of $ 40 for non-members). A technology writer and sales & marketing executive at bodHOST.com, a cloud & dedicated server hosting company based in New Jersey.